On the verge of extinction in the 1980's, the Black Rhino became the symbol of conservation as support rallied to put a stop to poaching and save this species. The combination of zero tolerance approach to poachers, public support and education reaped great benefits for both the Black and White Rhino and became the conservation success story of the century as population numbers climbed year on year. The rhino was saved, we could stop worrying. It seems we were lulled into a false sense of security after a job well done. Unfortunately, it's never that easy. Just as bacteria grow resistant to antibiotics and breed stronger strains, the poachers are back; stronger than ever. With the price of rhino horn at it's highest level ever, outstripping the price of gold, the poachers can afford to go high-tech. They go in with helicopters, mimicking the patrols and movements of conservationists. The helicopter is used to either direct ground parties to their quarry or more directly, to find and kill the rhino, harvest the horn and disappear before an alarm is raised. On occasion, scheduled veterinary drugs have been used on the rhino, but even then it doesn't always survive. Overdosing, cutting too deep into the horn and not treating the area after dehorning can all lead to death. 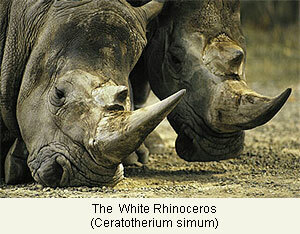 What use is rhino horn? Most of the horn from rhinos killed in East Africa ends up in the Yemen, where it is made into ornamental handles for daggers (jambiyas) while horn from rhinos poached in southern Africa (as well as from those poached in Asia) makes its way to the Far East where it is used in traditional medicine. Although jambiyas can have handles made of a range of substances, such as precious metals, buffalo or plastic, and can be decorated with gemstones, those made of rhino horn are regarded as the highest status symbol. Contrary to popular belief, rhino horn is not used as an aphrodisiac. In certain Asian countries, ground rhino horn is used to cure almost everything such as headaches, fever, typhoid, vomiting, smallpox and arthritis, but not impotence and sexual inadequacy. 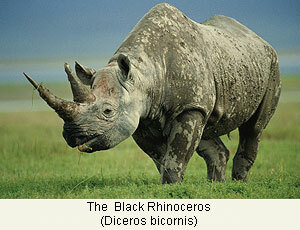 Rhino horn has been an integral component of traditional Chinese medicine for thousands of years. It matters little where the rhinos come from; the horn of a rhinoceros from any continent may be used for medical purposes. Although rhino horn has no medicinal effects on humans, superstitions about rhino horn persist in southeast and east Asia, where rhino horn is unfortunately believed to be a "remedy" for various ailments, such as fever and pain. The cultural myths surrounding rhino horn are why rhinos are slaughtered illegally - and why wild rhino populations in Africa and Asia are at risk of extinction. There are five species of rhinoceros, and with the exception of one subspecies of the African white rhino, all are in danger of being hunted to extinction for their horns. Poaching is once again reaching levels that the rhino population cannot survive and we need to act now to save the rhino again. A look at the figures for the last few years shows the alarming growth in poaching. There are two main reasons for this increase that can be directly linked to the control actions effected by the Department of Environment and Tourism. First was the implementation of the Threatened or Protected Species (TOPS) permitting system in early 2008, that closed the door on using hunting as a method of obtaining the horn. Second, a national moratorium issued in February 2009, placed an indefinite ban on the trade of individual rhino horns, any derivatives or products of the horns within South Africa. This has totally cut off the small, but legal, supply that was on offer, enabling the black market to exploit this resource once again. Banning has never worked as a control method. By allowing a controlled trade in rhino horn, we can diminish the black market demand and invest the proceeds back into conserving the rhino. Visit StopRhinoPoaching.com for information on donations, signing a petition, reporting suspicious activity and creating community awareness. Become a fan of Saving Rhino's on facebook and invite your friends. The name Mesembryanthemum (the genus that vygies belong to) was first coined by Jacob Breyne in 1689 to convey the meaning 'noon-flowering' from the Greek Mesembria meaning midday.